Ambassador Raghavan traced various phases of Indo-Pak relations since inception of Pakistan and highlighted how internal situation in Pakistan and developments around the world had affected the relations between the two neighbours since 1947. He described Pakistan’s internal crisis after weakening and disposition of Gen Musharraf as hugely responsible for the deterioration of bilateral relations after 2007. Ambassador Raghavan averred that Pakistan has caused great harm to itself by promoting terrorism. There is crisis of internal stability and no institution is immune from erosion of authority. On the other hand Indian is developing economically and policy to deal with Pakistan has been consistent irrespective of which political party is at the helm in New Delhi. The variation in packaging of the policy need not be seen as any significant shift. Dr Raghavan felt that India should use its strengths of diversity, economic power and cultural power to meet the challenge posed by Pakistan. The risk of failure should not deter us from making efforts to improve bilateral relations. Rahul Jalali, Chairman, Confederation of Press Clubs in India moderated a very lively discussion ranging from dealing with Pakistan, inflicting costs, mitigating sufferings of the people in Jammu and Kashmir by improving bilateral relations to apprehensions of strengthening China-Pakistan relations. Prof Ashok Aima, Vice-Chancellor, Central University of Jammu, in his Presidential remarks argued that dividends of peace far outweigh the costs of violence. He urged the Higher Educational institutions to play a more active role and the civil society to become an arbitrator of building confidence measures. Earlier Dr. Ashok Bhan, Former DG Police and Patron of IIPA, J&K Branch welcomed the guest speaker and introduced the guest speaker and the subject. He recalled the relatively peaceful period of Indo-Pak relations during 2003-2007 and wondered whether this can be recreated. 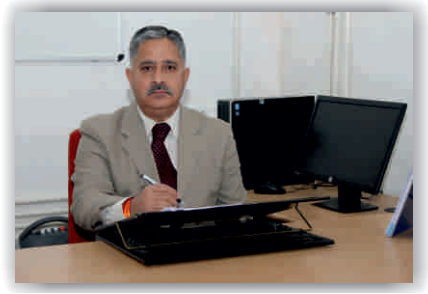 Dr. Anil Gupta, Joint Secretary, IIPA and Dr J. Jaganaathan of CU Jammu ably organised and conducted the program. Er. JBS Johar, Hony Secretary, IIPA JK Branch, presented a vote of thanks. Former DGP and CVC Kuldeep Khoda, K B Jandial, Dr C.M.Seth, B.L.Saraf, Prof Bhatia, Prof Deep Shikha Kotwal, Dr Sudershan Kumar, A.M.Watali, Saleem Begh, members of IIPA and faculty and students of CU Jammu and Jammu University were among those present on the occasion.